There are two main airports in Sicily: Punta Raisi Falcone Borsellino in Palermo and Fontana Rossa in Catania. Also in Trapani there is a small airport "Birgi", which is only used for domestic flights. Several international airlines fly to the three airports, like for example: Alitalia, Meridiana, Lufthansa, British Airways, Wind Jet, Easyjet, Ryanair. Trains (www.trenitalia.com) to Sicily are loaded via the Straits of Messina directly into the ferry (Caronteferries). 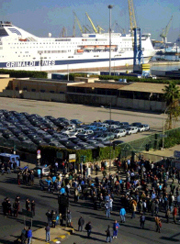 Additional services sail from Genova, Naples, Livorno, Cagliari to Palermo. The main companies are: Tirrenia, Grandi Navi Veloci, Siremar, Ustica Line.